Here comes the Divisional Round of the playoffs! 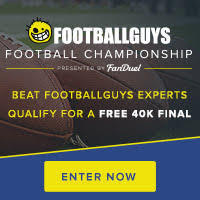 And as always, the Footballguys.com DFS team has another installment of Friday Staff Cash Plays for the upcoming weekend. this week there is a lot of consensus to be found across the spectrum of possible starters. David (Johnson, $8,500) is Goliath this week - Johnson appears on 10 of the 11 lineups submitted for this review. He's one of the few options at running back this weekend that doesn't have another runner threatening his featured-back share of the carries. Jonathan Stewart ($6,300) has Cam Newton to siphon off touches and TDs; Fitzgerald Touissant ($6,200) has Jordan Todman ($5,700) to deal with; and the Patriots will have a committee of backs sharing touches vs. Kansas City, to name just three of the other units in play during the weekend games. The Big D is in Denver ($5,300) this week - nine of the 11 staff lineups submitted as of this blog posting featured Denver in the team defense spot. The sizable home field advantage of Sports Authority Field at Mile High; Ben Roethlisberger's injured throwing-arm shoulder; and the fact that Antonio Brown has been declared 'Out' for the game all contributed to the enthusiasm for this unit. Arizona ($4,800) and New England ($4,700) each attracted one adherent from the staff. Greg Olsen ($6,500) is the overwhelming choice at tight end among the staff, with nine owners selecting him - Travis Kelce ($6,600) came in a distant second at two appearances on staff rosters. Cantanzaro Fever! Chandler Catanzaro ($4,800) is another favorite pick of the staff here in the depths of winter - Catanzaro plays for the powerful Cardinals' offense and will be kicking in a domed environment this weekend, and he landed on nine lineups as a result. Graham Gano ($4,900) and Mason Crosby ($4,500) were both on one lineup for the weekend. Enjoy the NFL action this weekend, everyone! Good Luck! Don't you think that it is a bit sad, how big websites like FanDuel slowly destroy smaller ones that have way better content and more quality? I am talking about websites like https://www.dailylineups.com/. The website is awesome, but it has nowhere near as much popularity as FanDuel. Do you think that that might change? Welcome to the premier destination for top online casinos in Canada! You can play online casino canada from our site. If you’re Canadian, love playing games at a casino online, and are looking for unbiased reviews of the top casino sites, then you’re in the right place.